The good folks over at TANGO have really outdone themselves with one of the most innovative set of gimmicked coins imaginable! Mr. Tango did it again! Triple T.U.C is an innovation of the famous TUC, the coin set which many consider the best coin trick of all time! These coins even won the FISM Premioinvención in 2012. Triple T.U.C gives you the ability to perform the same effects as the regular T.U.C but also many more effects are now possible! The set includes a link with 25 routines with the T.U.C and new professional routines using the properties of the Triple T.U.C. 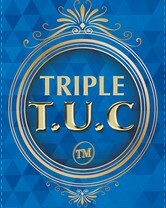 Simply start the Triple TUC and you are limited only by your imagination. Yes - It really is that good! These sets are available in a dollar, half dollar and quarter. Of course, this is a quality Tango Magic product.